Me in the first version of a jacket based on the silk lining front pieces from the ”Kulturforum Burgkloster” in Lübeck. In 2005 I visited Lübeck for an SCA event. Before flying home I visited the ”Kulturforum Burgkloster”, and there in one of the show cases were the two front pieces of a silk lining from a womans 16th century Frauenwams. There was no back piece nor sleeves or gussets. This was super exciting, but the museum had no postcards of these textiles, nor did they have any kind of publication with a picture of it. When I came home I tried contacting the museum but never got a response. Eventually I asked a friend in Germany to help me, and a few months later I had the conservation documentation in my hands. I don’t have permission from the museum to publish any of their pictures or share the conservation documents, but I will write up what I know about this find for you, and below you’ll find my drawing of the pattern of the front panels. The shape of the two front panels of the Frauenwams from Lübeck. • The two front panels of the silk lining were found in the inner city of Lübeck. The conservation was done at the Storstrøms Konserveringscenter in Næstved, Denmark. The find has the catalogue number 1402/2 K1. • While the textile find was cleaned they managed to take some samples of fibers which were examined under a microscope. The fibers are pure silk from the silkworm of the Mulberry tree (Bombyx Mori). The fibers were in surprisingly good shape and only had small damages. • Once the textiles were cleaner some interesting observations were made. There was a forgotten pin fastened in the original position in the lining and there were traces of top coat wool fibers on the part of the panels that would be positioned to the rear of the person wearing the jacket. • The edges were all folded and stitched down with silk sewing thread, the original thread remaining. • The pieces were of the typical brown shade that organic finds from a sewage milieu have and all indications point towards that someone has made changes and adaptations to the original jacket and the no longer needed front panels of the lining have been disposed of. • The silk is of a regular tabby weave. The jacket obviously had a silk lining, and the find from the wool fibers indicates that the outer fabric was wool. The top coat of a sheep is a thicker fiber than the under coat also indicating that this jacket was not made out of the finest quality of wool. The shape of the front pieces of the lining is very interesting since it has a v-neck cut, something not seen in any of the picture sources I’ve seen from either German 16th century art nor the English art (I looked at English fashion since waistcoats/jackets were rather popular there as well). There is one embroidered waistcoat at the V&A that has a v-neck, but it is cut much wider than the v-neck on the lining from Lübeck. The German art mostly shows rather high cut rounded necklines or earlier in the 16th century, square necklines. A difference noted is that the curve at the back of the front panels is larger in this German find than in the English finds, making the back piece of this outer garment very narrow. Since the textile find only included the front panels I had to make up the shape of the sleeves, and I assumed that the jacket had at least 4 gussets since there are two slits cut in the front pieces for gussets and then to make the jacket fit at the back it would be safe to assume that another 2 gussets had been inserted in the seams joining the front panels to the back piece of the jacket. A house maid from Nürnberg from Hans Weigels Trachetnbuch from 1577. My favorite inspiration over the year has been artwork from the Nürnberg area and even if it is far between Lübeck and Nürnberg I really wanted to try the puffed sleeves of the house maid jacket depicted in Hans Weigels Trachtenbuch from 1577. That Frauenwams also seems to be of a corresponding length to the find from Lübeck. 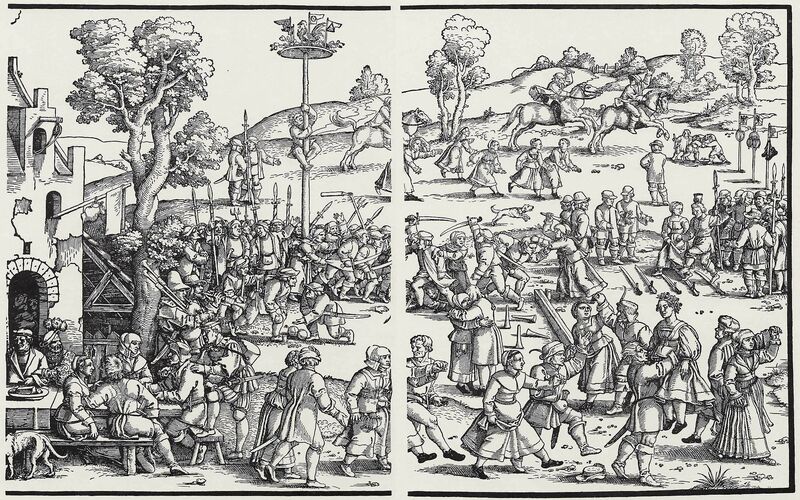 Looking at some woodcuts by Hans Sebald Beham (For instance Das große Kirchweihfest from 1539) the earlier jackets seem to be a bit longer, reaching the upper part of the thigh of the women wearing them. Most of the depictions of women wearing these Frauenwams show maids or farmers. Upper class women are more often depicted wearing longer schaubes or gollars, but there are a few examples in Weigels Trachtenbuch. They seem to be made out of brocade and not be embroidered like the English linen waistcoats. Some very talented friends of mine (in the SCA known as Mistress Helwig Ulfsdotter, Mistress Lia de Thornegge, Viscountess Philippa Birgersdotter and Viscount William of Richwood) helped me create a pattern for the jacket. I chose to use a rather thin blue and black herring bone twill out of wool for my outer fabric and a yellow/blue tabby woven silk for the lining. The sewing threads used were all silk. Originally I had planned to make all the hooks and eyes myself but in the end I had to realize that my hands were not up for that task back then so I asked my friend Riku from Swan River Crafts to make me some hooks and eyes. Then I did some more research on jacket/waistcoat constructions by reading Seventeenth-century Women’s Dress Patterns – Book One – Edited by Susan North and Jenny Tiramani, especially looking at techniques for inserting gussets and stitches used in the jackets and sequences of assembly of the different pieces. The conclusion being that all jackets have the gussets inserted pretty much in any technique the maker saw fit and that went for stitches used too, however back stitch and running stitch dominated. The silk lining being turned and stitched in place in the armscye of the almost done jacket. You can see the turned seam allowance from the outer fabric helping the puff to be puffier. I inserted my gussets by backstitching them in – the ones in the seams at the back were easy – and the front ones were back stitched almost to the top and once both sides were almost stitched in I stitched the top in place from the outside. The sleeves were back stitched together (pattern is the S-curve sleeve that was extended at the top to make a puffed sleeve) and then the lining was sewn in place at the wrists and the whole sleeve (lining and outer fabric) were stitched into the armscye of the outer fabric. I took one step away from the indications of the actual find from Lübeck by sewing the lining of the body together with the outer fabric leaving it open at the neck and then turning it. (The find had the edges of the lining all stitched down with the original silk thread and I did not stitch down the lining seam allowance around the edges – I only felled all the seams). The eyes sewn in place. You can see the three rows of stab stitches holding the lining and outer fabric together so the fabrics won’t pull when the jacket is closed. Once the frauenwams was turned I closed the hole at the neck and then I stab stitched the edges all around the jacket. At the front where I would add the hooks and eyes I did three rows of stab stitches to reinforce the closure. After that I stitched down the edges of the lining around the armscye. The last thing was to add the 23 hooks and eyes to close the jacket. I am happy with the result but version 2.0 will be tweaked a bit. • I will not use a herring bone twill since that weave is not common in 16th century finds. • I will refit the gussets on the jacket since the jacket was originally fitted over a dress with much less fabric around the hips making the jacket wrinkle at the back since the silhouette of this heavy woolen dress is different than the thinner dress the jacket was fitted on. • The next version will have a plain sleeve as is seen in lots of the woodcuts and other depictions of Frauenwams. • When assembling the jacket I will make it with the turned seam allowance to be more true to the find. And here is the final result – me in my sleeveless dress with the jacket based on the extant find from Lübeck but with the Nürnberg puffed sleeves. Front view of the Frauenwams based on a find from Lübeck. Back view of the Frauenwams from Lübeck. As you can see the dress I ended up wearing with the jacket is fuller around the hips pushing the jacket up and creating some wrinkles. The fix would be to insert the gussets a bit higher on the next version of the jacket. The side view of the Frauenwams based on the find from Lübeck. This is a spectacular post. I really enjoyed reading about your process. Thank you for sharing your research and efforts.